Rock climbing in the heart of Havana? The nine-meter-high climbing rock is located in the green forest of Havana, at the river Almendares. Experience is not necessary! A guide with 15 years experience will give you a safe and unforgettable afternoon. Also for climbers with experience. Every afternoon from 3 pm. Duration: about 3 hours. Are you planning to visit the Valle de Viñales National Park in western Cuba? This breathtaking valley with enormous limestone rock formations is the place for walking or rock climbing. In three hours, walk on flat sandy paths of red soil through the beautiful landscape of tobacco fields, sugar cane plantations, farms and ‘casas de tabaco’, triangular drying chambers covered with palm leaves, where the tobacco leaves are dried. If you like, visit a planter's house and buy the cigars that the farmer is making in front of you. Price: 20 USD per person. Are you adventurous? Then go rock climbing under professional guidance. Feel and smell the beautiful ‘ mogotes’, the limestone hills that you will climb. You do not want to miss the view at the top of the route! A climbing excursion takes about four hours and experience is not necessary. Material is included. Price: 35 USD per person. Cuba has kilometers of caves that have not yet been exploited by tourists. Are not you afraid of small, dark spaces? Then visit one of the thousands of caves that Pinar del Río counts. An excursion lasts a day part and materials are included. Under professional guidance. The price depends on which guide you accompany and which cave is visited. 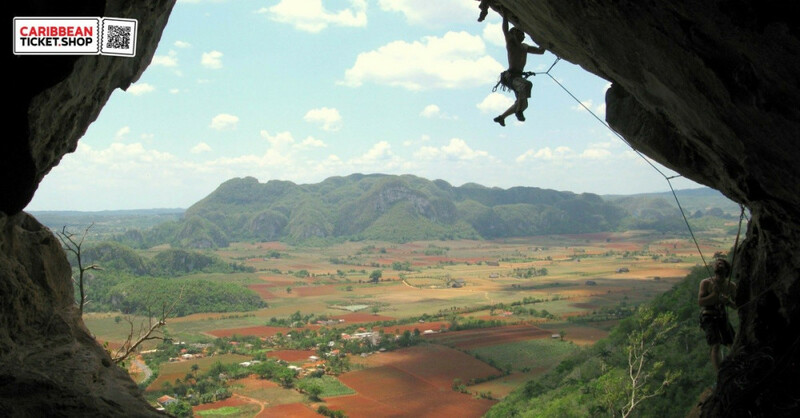 Guided rock climbing in Havana or Viñales, Cuba for 3 or 4 hours. Climbs and Tours in Viñales are possible on appointment only because of the remote location.